2nd Trump-Kim summit expected to announce peace declaration. February. 11, 2019 07:43. weappon@donga.com,journari@donga.com. 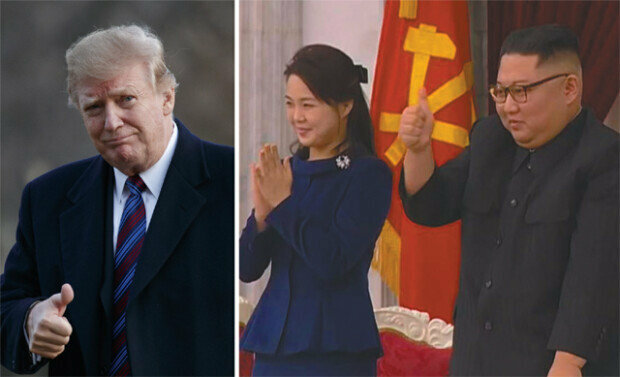 The U.S. and North Korea have reportedly reconciled differences during the three-day working-level talks in Pyongyang by agreeing to include an end-of-war declaration and a partial report of Yongbyon nuclear facilities in the Hanoi Declaration to be adopted in the second Trump-Kim summit. The two countries are planning to work on the denuclearization roadmap agreement in working-level meetings to be continued next week in the third Asian countries such as Vietnam. “U.S. Special Representative for North Korea Stephen Biegun said the working-level talks in Pyongyang contributed to the second summit,” said a diplomacy insider. “The war-end declaration and partial reporting of Yongbyon nuclear facilities are likely to be included in the agreement of the Hanoi summit.” This means the two countries have reached an agreement on the measures Pyongyang needs to take during the initial phase of denuclearization. Biegun had a working-level talks with Kim Hyok Chol, his newly appointed North Korean counterpart, from Wednesday to Friday in Pyongyang and briefed South Korean Foreign Minister Kang Kyung-wha and National Security Office chief Chung Eui-yong on the result of the working-level talks on Saturday before returning to Washington on Sunday. In a meeting with South Korean lawmakers, Biegun said that North Korea was a lot more enthusiastic than before. Some pundits say that North Korea would have suggested shutdown of uranium nuclear facilities other than Yongbyon nuclear complex in return for easing North Korea sanctions. “We have some hard work to do with the DPRK,” said Biegun to Kang on Saturday, which suggests that additional negotiations should be followed.